This case study sees Jane our traditional business analyst put into no specific role as a business analyst and so ends up in the position of proxy product owner. This tends to be because the organistion she works for either does not employ Scrum, the Product owner is largely unavailable or not able to fully fulfill the Product Owner role. This is part 3 of a series which does not need to be read in any particular order, but at least reading part 1 will help to understand the context and overview. My first comment is a disclaimer 0f sorts , I am already hearing the disagreements with my view here and they are just the voices in my head! For the sake of a brevity I will stick with the founding principles of Scrum and ignore that in some ways this might be the first step that they make toward Scrum. I am highlighting here that it is not true Scrum if there is a proxy product owner and although may work to a degree it does add an unecessary layer. The layer would likely be created by; fear of change, misconception of true Scrum, politics or sometimes just to take a useful step in the right direction for the business. Whatever the reason for a less than purist approach, this set up is not Scrum. 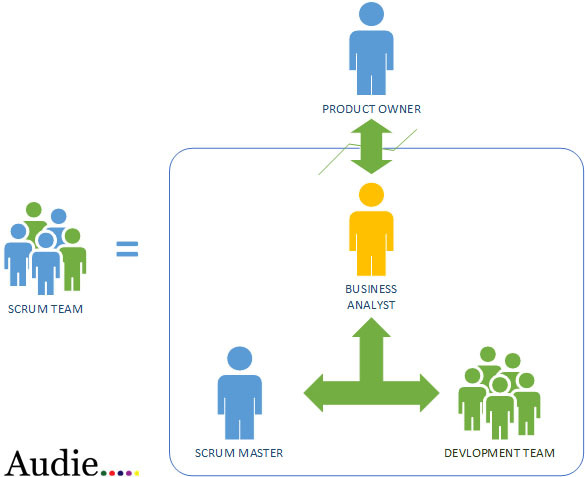 The goal of this article therefore is to highlight the purist Scrum approach and the typical pitfalls brought by adopting a proxy product owner role on a Scrum team. When is a traditional business analyst a proxy product owner? Why is this not good in terms of Scrum? Let’s look a little deeper at each of the reasons why the business analyst becomes a proxy product owner and what that means for the Scrum Team. Jane is forced to take on some of the product owners tasks in her roles as her product owner is unable to spend the time with the Scrum Team that is required and the project is not progressing as required without her stepping in. Jane is forces the Product Owner out of the team due to her being a strong personality and just taking over. This happens although should be very rare. The Scrum Master should deal with this as an impediment to the Scrum Team’s progress and help the Real Product Owner make their way back to the Scrum Team in the position they should be in. The Pro’s and Con’s in this scenario are roughly the same however with the forced removal of the real product owner it is likely that Jane is comfortable making key decisions on the project. Indeed in this scenario Jane is likely to force her decisions onto the team. Jane in this case is making the best of the situation she has been put in and whilst it may be a good start toward an Agile framework it hopefully is not seen as the end point. I would suggest that it is a temporary position and a useful stepping stone along the way to becoming a good Agile team. There should be a focus on early training for all of the team members so that they may be able to clearly understand the Scrum roles. There should also be intervention and coaching from a Scrum Master and Agile coach as needed to ensure the team align correctly to the basic building blocks of the Scrum framework. This position is not ideal but could be seen as a good step in the direction of adopting full Scrum, it needs to be a step in the right direction and not the final picture though as this is not Scrum and is not the ideal way to operate with the framework. I think that whilst the Product Owner is one of the most natural fits for a traditional business analyst role when moving to Scrum the Proxy Product Owner is effectively placing one too many communication points and roles in the way of the Scrum team which in turn eliminates the implied efficiencies and ideals that Scrum is meant to bring. I think that if Jane is in this position she should only be expecting to be in it temporarily, if this role is anything but temporary the negative effects on the Scrum team would probably outweigh any or most of the positives Scrum offers.